Pizza and kids go hand in hand. There aren’t too many kiddos who don’t love pizza. No offense to Domino’s Pizza, but after a while I tend to get tired of my girls’ “go to” pizza of choice. That’s why I’m always up for a visit to Pizza Tower. Obviously, pizza is their specialty but they also have a great selection of menu items – salads (get the family size salad for $6.79 to share), pastas, wings, wraps & calzones. They also have some yummy specialty pizzas and they serve adult beverages. Happy hour, here we come. Pizza Tower is made for families. The building is sort of shaped like a tower (thus the name) and the circular staircase winds up and up to different dining levels. The first level is all about the kids and the pale blue covered walls are adorned with some of their favorite cartoon characters – Scooby Doo, Dora, The Peanuts gang and more. 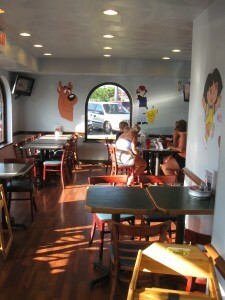 There’s also a mini television viewing area where the kids can watch a kid-friendly show while you wait for your meal. Here you don’t have to worry about the noise level – all the families eating seem to cancel one another out. The service is friendly and fast. I think they’ve perfected how to serve families. When you’re seated, they provide each child with a fistful of fresh dough for them to shape and mold. The kids’ meals ($2.79-$3.99) also include a small cup of soft serve ice cream but drinks are extra ($.99 with free refills). Our favorite night to visit is Wednesday since it’s kids’ eat free night. Two kids can each get a free one-topping pizza with a minimum adult purchase of $5. I also love the Pizza Tower pizza, there’s something about the crust that tickles my taste-buds and both my kids and I like the sauce (small feat in our family). If I give the girls a choice on where they’d like to go to dinner, they happily chant, “Pizza Tower, Pizza Tower”. It’s a win-win for all of us. 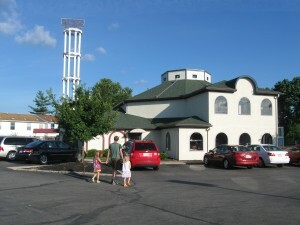 If you’d like to visit, Pizza Tower is located at 8945 Governors Way, Cincinnati, Ohio 45249. They also do carry out or delivery within a five mile radius. Call (513) 683-8400.
which may be quite interesting. It presented me a few ideas and I’ll end up being writing them on my webpage soon. I’m bookmarking your website and I’ll be backside. Thank you again! Hi Katie, Pizza Tower is located off of the Fields Ertel exit of I-71 if you’re heading N on I-71(close to Mason). 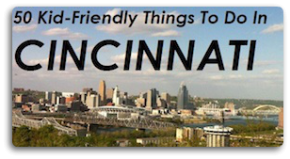 whereabouts in cincy is this great place?!? !